A previous production of “Every 28 Hours,” performed at Trinity Repertory Company in Rhode Island. As a theater that strives to be at the nexus of art and social change, Boston’s Company One Theatre is deeply invested in audience engagement. Recently, it’s placed a new emphasis on “responsive programming” that can tackle hot-button topics or conversations that have erupted in the public sphere. So when the company was approached about participating in a national play festival dedicated to grappling with issues raised by the Black Lives Matter movement, it leapt at the opportunity. Dubbed “The Every 28 Hours Plays,” this festival features 85 one-minute pieces from writers across the country that grapple with police brutality against African-Americans, racial profiling, and systemic bias in the criminal justice system. It takes its name from an oft-repeated yet contested statistic: that every 28 hours in the United States, a black person is killed at the hands of a vigilante, security guard, or police officer. The plays will be presented in Boston Saturday at the Museum of Fine Arts’ Remis Auditorium at 2 p.m. The free event will be followed by a discussion and other post-show programming, including a workshop on one-minute plays led by Obie Award-winning playwright Kirsten Greenidge. Developed in St. Louis and Ferguson, Mo., the project is the brainchild of Oregon Shakespeare Festival community producer Claudia Alick and One-Minute Play Festival artistic director Dominic D’Andrea. Company One is spearheading the event in Boston alongside four local collaborators — the Central Square Theater, the Theater Offensive, Boston Arts Academy, and the Harvard University black student theater group BlackCAST. For Shawn LaCount, Company One’s co-artistic director, theater is uniquely qualified to tackle these radioactive issues and to foster a deeper connection among audiences. Among the dozens of playwrights represented are Greenidge, Tarell Alvin McCraney, Kristoffer Diaz, Neil LaBute, Lynn Nottage, David Henry Hwang, Idris Goodwin, and Robert Schenkkan. The plays capture the perspectives of black youth confronted with police bias; the suffering and fears of black mothers; the hopes and frustrations of protesters on the front line; and the historical perspective of racial injustice. There’s even a short about a police officer having to make a split-second decision between life and death. For the Boston edition, Theater Offensive is contributing five additional gay and lesbian-themed plays. Alick says “Every 28 Hours” grew out of what is referred to as “the Ferguson Moment.” In the wake of the police shooting of Michael Brown, she and a group of theater artists from across the country traveled to Ferguson to spend several days listening to artists and members of the community describe oppression, violence, and resistance there. 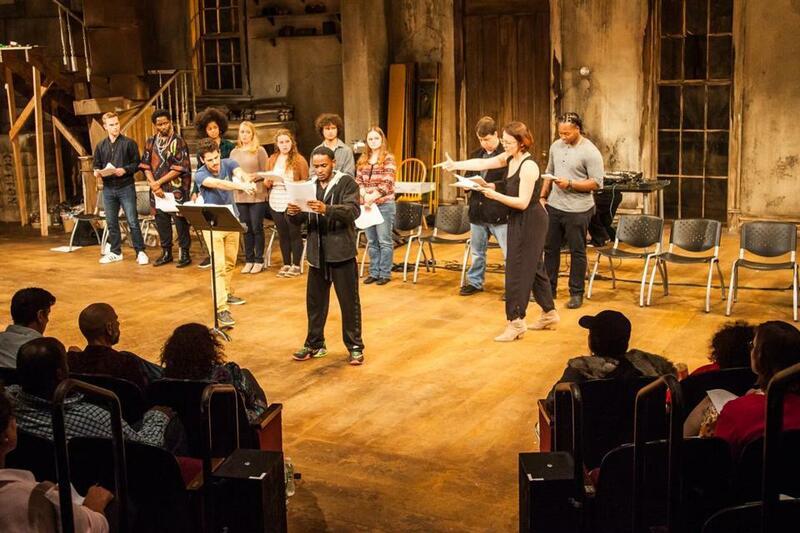 All 80 plays were staged at Oregon Shakespeare Festival and in St. Louis and Ferguson last month. “Every 28 Hours” is being performed as readings or fully staged productions at dozens of theaters around the country in at least 25 states. After the performance at the MFA, audiences will be able to choose among various post-show activities, including a discussion led by a facilitator, a wall where guests can draw or paint their feelings, and magnetic poetry. Guests will also be invited to write their own one-minute plays. Actors will be on hand to read them afterward, and they will be published on the Company One website. The MFA will also allow audience members to walk through its current exhibit “Political Intent,” which showcases how artists use creative expression to explore political and social issues.